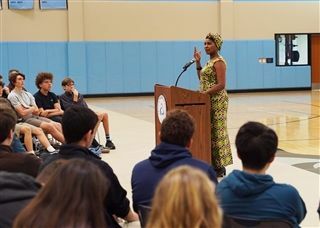 “You have the power to confront and prevent atrocities,” genocide survivor Marie-Christine Nibagwire told upper school students on December 6 during Community Life. Ms. Nibagwire survived the Rwanda genocide of 1994 narrowly escaping death with her two-year-old daughter on her back. After telling her harrowing story of survival, she asked students to reach out to people in need and be the peace they hope to see in the world. She also talked about the non-profit she founded, Saferefugerwanda, which provides emotional support to victims of the genocide.